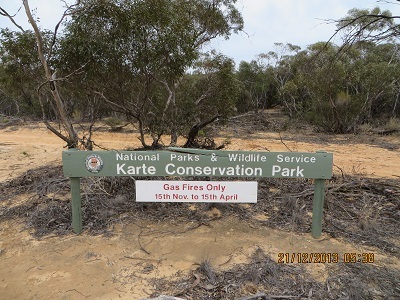 On 21 December 2013 on my way to Sydney to see my son I thought I would activate Karte Conservation Park. This park is about 30k North West of Pinnaroo. I called CQ on 7100 for a while and there were no takers. There were quite good signals up and own the band. I apologise for not posting my intentions – but I wasn’t sure what time I would get to Pinnaroo or whether I would be able to activate these Parks with Christmas looming! 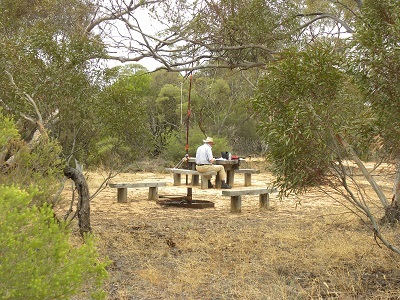 I was delighted to work VK5AV, Tim from Mount Gambier , at 04:29 UTC, who kindly posted on the parks and summits site that I was in Karte CP. He also gave a call over the South East Radio Group’s repeater system and I soon had contacts with VK5HCF, Col; VK5WG, Nev; VK3GFS, Frank; VK5EE, Tom and VK5BW, Barry. The 40m band seemed pretty good and my reports were encouraging, except from Col, who gave me a 3 by 3. I was able to congratulate Nev on his elevation to Sainthood, I mean Slothdom! I am envious with a long way to go!